We’re big into wild birds at Gardening on A Dime. The sounds and sights of birds singing and feeding is one of nature’s natural gifts to all gardeners. Since spring has sprung in the south, one might think that it is a little late in the season to read about caring for birds in the winter. But for some folks, winter is still hanging on for a few more weeks. Our bird friends can usually always use our help, regardless of the season. So, check out this article. Suet has changed for the better. I’ve tried suet in the past and will have to agree with the author……..”congealed animal fat”…..yuck! Read on. You might be able to help your feathered friends in the backyard. (ARA) So you think you know suet? Think again. Today’s suet is not the messy, hard-to-manage lump of congealed animal fat that your grandparents had to contend with. Modern suet has gone gourmet, and can be served in convenient suet cakes, suet kibbles, suet nuts and suet pearls loaded with treats that backyard birds adore, like nuts, grains and berries. You can even find squirrel-proof varieties that thwart the bushy-tailed bullies by including habanero pepper in the succulent fat. While many species, like robins and sparrows, will migrate south, many stay put, like cardinals and chickadees. These birds rely on high-calorie, high-fat foods, like suet, to help maintain their increased metabolic rate during a season when their normal food sources, such as insects and berries, are scarce. If you want to attract a bounty of birds to your backyard during cold months, fat is your friend. Birds love suet, the solid fat rendered from beef, venison or vegetables that provides concentrated energy to help birds make it through freezing winter days and nights. Typical suet-eating birds include woodpeckers, bluebirds, chickadees, titmice and nuthatches, but you never know who might show up, like a kinglet or warbler. Feeding birds through winter can actually improve traffic at your feeder, since many birds will find and stay where there is a reliable food source. While birds need suet during winter, they also need a variety of foods that normally constitute their diets as well. Supplement your suet feeding with plenty of seeds, presented in a variety of feeding styles. Variety and reliability will attract birds and keep them coming back to your yard throughout the year. One way to cater to birds that love seeds, nuts or berries is to try a suet-seed mix like Nutberry Suet Blend, offered by Cole’s Wild Bird Products, which mixes human-grade cherries, apples and blueberry-flavored cranberries, preferred nuts, nutritious insect suet kibbles and whole kernel sunflower meats into an energy-packed, powerhouse feed. Cole’s suet cakes are offered in an assortment of blends, such as Blue Ribbon, mixing rendered beef suet, sunflower seeds, millet, and cracked corn, formulated to attract the largest variety of birds. You can also stir things up further by serving some innovative “gourmet style” suet products that are in forms other than traditional cakes. Try Suet Pearls, which offer sunflower meats buried within energy full suet pellets; Suet Nuts, that combine nourishing peanuts with berry suet; or Suet Kibbles, which mix berry flavor and dried insects in a convenient, non-messy, kibble form. Squirrels love suet too, and can quickly consume a cake that would otherwise feed dozens of birds for days. To discourage squirrels, Cole’s offers Hot Meats suet cakes, which uses a patented technology tested by scientists at Cornell University, consisting of rendered beef suet, red chili peppers, sunflower meats, corn, and oats. Birds love it but can’t taste the heat that squirrels hate. Different species of birds prefer different types of feeders, so supply several styles of feeders arranged around your backyard. You can serve up suet in traditional suet cages as well as wood and cage style feeders that protect birds from the elements by making them hang upside-down while feeding. 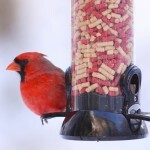 You can also use peanut feeders to serve newer, innovative suet products like Suet Pearls, Suet Nuts and Suet Kibbles. Be sure to locate feeders out of the wind, positioning them near natural cover and perches like bushes and trees. For ground feeding, provide an area near cover with a clear view of the surroundings. This winter season, boost backyard birds’ energy levels and serve up suet. You’ll enjoy winter bird-watching and the birds will benefit from the extra energy suet provides. Be patient though, it may take a few weeks before the birds discover newly placed feeders. While you wait, be sure to keep the feeders full. Eventually, the birds will come. For more information on Coles Feed visit www.coleswildbird.com. Now you know…..there is no excuse. Help your neighborhood birds and they will reward you with hours of pleasure. Wow, you’ve got quite a lot going on here. Very nice. I haven’t visited you in awhile. I’ll come back to read more when I have more time. It all looks wonderful! I want to thank you for your very kind words on my post. So appreciated! Great post with wonderful information. I have my feeder blowing in the wind unfortunately, but the woodpeckers don’t seem to mind. It just bothers me trying to get a picture of them. Here too, our spring winds make it impossible to take photos of anything higher than a couple of inches off the ground. Our best time is very early in the morning or just before sunset.